Hi Friends: Jessica is ready to start launching her new clear stamp sets over at JessicaLynnOriginal stamps! The first set is a really cute AKC set Corgi 2017 With Pug Friend which is available for pre-order with free shipping until the release date on 2/25/17. All of the DT members are making at least 3 projects with this darling set. Here's my first project - it's a Flip Card with the front and back Corgi images - isn't this fun! For me, this is a pretty CAS card - but I think the cute little Corgi really takes the stage! Stamp the Corgi front and back images onto Ultra Smooth Cardstock with Memento Tuxedo Black ink and color with Spectrum Noir markers. Stamp the Happy Birthday sentiment on the Corgi's back. Add Glossy Accents for some shine and dimension on the Corgi's eyes and nose. Die cut the Corgi images with the Majestic Labels die. Die cut the Bella Dots card using the Majestic Flip Its Card die. 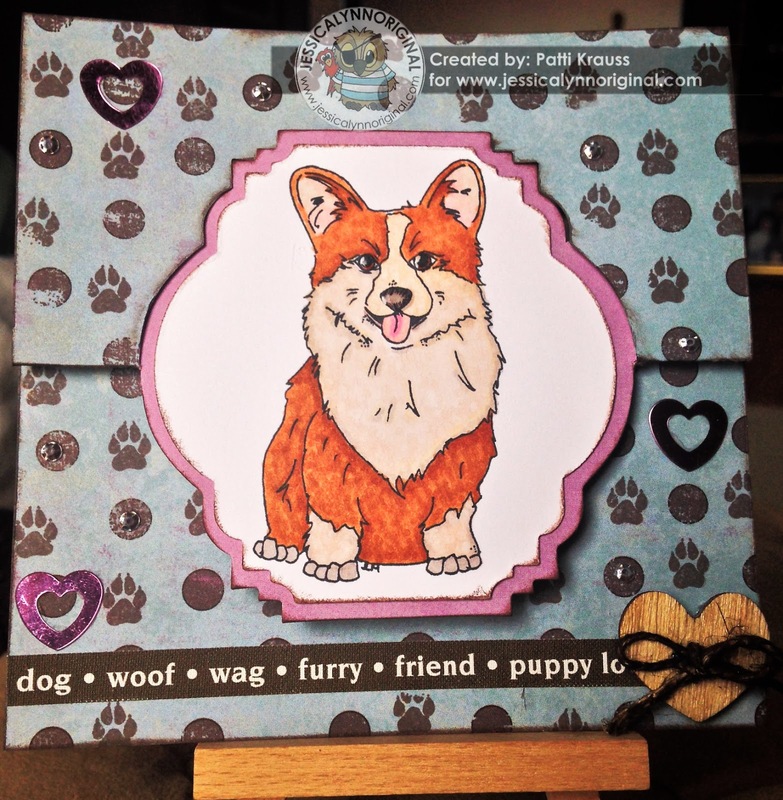 Stamp the Corgi paw prints on the card using Memento Rich Cocoa ink. Ink all edges with the Prima chalk ink edger. Randomly add some small clear sequins and heart confetti to the card front. Add the dog sayings Fabric Tape to the bottom portion of the card. Die some jute with Walnut Stain Distress Stain and add it in a bow to the wood heart button - add the button to the lower corner of the card. Add the Corgi images to the front/back flip sections of the card. Enjoy! These stamps are perfect for a flip card! What a great idea! Love this! Patti, I just love the way you did your Corgi on a Flip card! It's awesome!